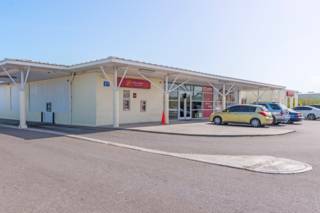 The Grace Bay branch of Scotiabank. 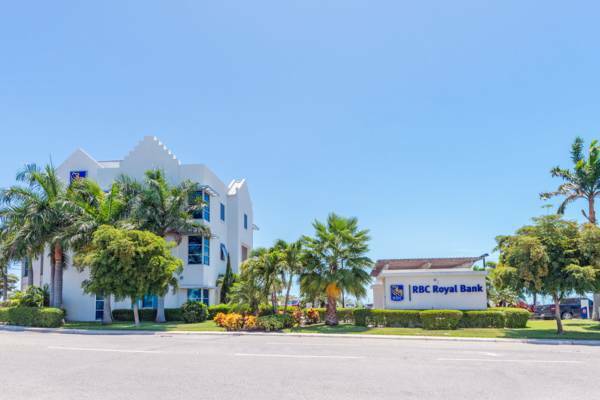 The Providenciales branch of the Royal Bank of Canada. Centrally located near the Graceway Plaza complex on Leeward Highway. Bank on Providenciales. Several international banks have branches in the Turks and Caicos. 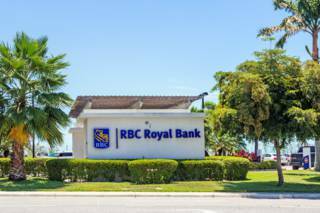 There are branches for several international banks in the Turks and Caicos Islands, primarily on the main island of Providenciales. Scotia Bank, Royal Bank of Canada, and First Caribbean International Bank maintain local branches. 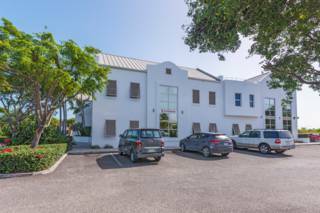 The financial services industry in the Turks and Caicos Islands is regulated by the independent, statutory Financial Services Commission (FSC), which was established in 2001. This body regulates the formation of companies, trademark and patent registration, domestic and international insurance, money remittance services, and banks and trust companies. All major local banks offer personal banking products with online banking and a MasterCard or Visa debit card for access of funds. It's advised to retain the services of a local lawyer or attorney when setting up an account on behalf of a corporation. For local corporations, a wide range of supporting documents are required, including a certificate of good standing, registers of shareholders and company directors and officers, and know-your-customer (KYC) documents on the company's principals. The major local banks offer mortages and some other local financial institutions specialize in this area. It's not always possible to obtain a mortage for buy-and-build (undeveloped land) due to increased risks to the financial institution. The exchange of some foreign currencies to the U.S. Dollar, typically including the British Pound, Euro, and Canadian Dollar, is offered at banks in the Turks and Caicos. However, due to fees and limited availability, we highly advise exchanging currencies before arrival in the country. Credit card acceptance in the Turks and Caicos varies by island and by type of business. The majority of establishments on the island of Providenciales that cater to tourism accept credit cards, especially vehicle rental companies, accommodations, and large tour and activity companies. Some of the smaller restaurants and shops only accept cash. As is the case with Providenciales, on Grand Turk, hotels, restaurants and excursion businesses typically accept credit cards, yet smaller shops may not. On the islands of North Caicos, Middle Caicos, South Caicos and Salt Cay, the larger accommodations are typically the only place credit card payments can be made. On Providenciales, ATM machines can be found at local banks, the Providenciales International Airport, and at the Graceway IGA supermarket. A few of the larger Turks and Caicos resorts also have an onsite ATM. Near Grace Bay, ATMs can be found at the Scotia Bank and First Caribbean branches at the Graceway Gourmet and Saltmills plazas. On Grand Turk, ATMs may be found at the local bank branches, at the Grand Turk Cruise Center, and at Cee's Wholesale. ATMs are difficult to find on our smaller islands. On South Caicos, a Scotia Bank ATM is found at the Super Value grocery store in Cockburn Harbour. North Caicos has one ATM located in the village of Bottle Creek. Middle Caicos and Salt Cay do not have an ATM. Providenciales is home to several financial institutions specializing in investment, wealth management, and offshore banking. Bank accounts in the Turks and Caicos may be held tax-free, and there are no controls on currency exchange or international transfers out of the Turks and Caicos jurisdiction. 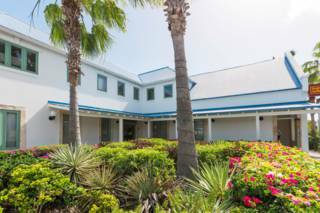 Barclays Bank was the first major bank to open in the Turks and Caicos, in 1981. This was followed in 1982 by ScotiaBank. In 2002, Barclays merged their Caribbean banking operations with CIBC to form FirstCaribbean, later retitled CIBC FirstCaribbean. TCI Bank was the first major locally-developed bank, which opened in 2005. However, it was closed in 2009. Approximately 76% of borrowers (totalling $66 million USD in debt) were in default. The Turks and Caicos solely uses the U.S. Dollar. In the past, the Turks and Caicos did issue coins in the Crown denomination, however, these were intended for souvenir and collectible purposes. As a British Overseas Territory, the likeness of H.M. Queen Elizabeth II is found on one side of all coins minted, and the other featured various historical, social or natural subjects.